Sell up to 50 units with Credit given! Read more about our Licenses. Find crafting inspiration, and learn how to make your own! Join my Facebook Group and share your projects with the Community! SVG cutting files – Separated layers for use with Silhouette Studio Designer Edition, Cricut Design Space, and other cutting machine software. Great for digital scrapbooking, invitations, teaching materials, & so much more! Files come in a ZIP format folder for faster downloading. This product is an instant digital download, which will be available for download from this site or your email after checkout. No physical items will be shipped to you! On your Smartphone or Tablet? No problem! You can save downloads right to your Dropbox, Google Drive, or other cloud storage from your mobile device and have your files waiting for you when you get to your computer! If you’re a llama lover getting ready for Christmas, then this festive Christmas Llama SVG is for you! Add a perfect touch to your Christmas scrapbooks, handmade Christmas cards, gift tags, and other paper craft projects! This Christmas Llama SVG File design features a cute llama wearing christmas lights and carrying Christmas presents on his back. Also included is a vinyl-friendly SVG version perfect for HTV t-shirts, handmade ornaments, and more! 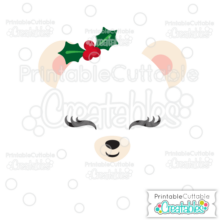 I’ve also included the Christmas Llama SVG File assembled, ready for Print & Cut or Cut by Color projects on your Silhouette, Cricut or other electronic cutting machine that supports a Print & Cut feature with no tracing needed! 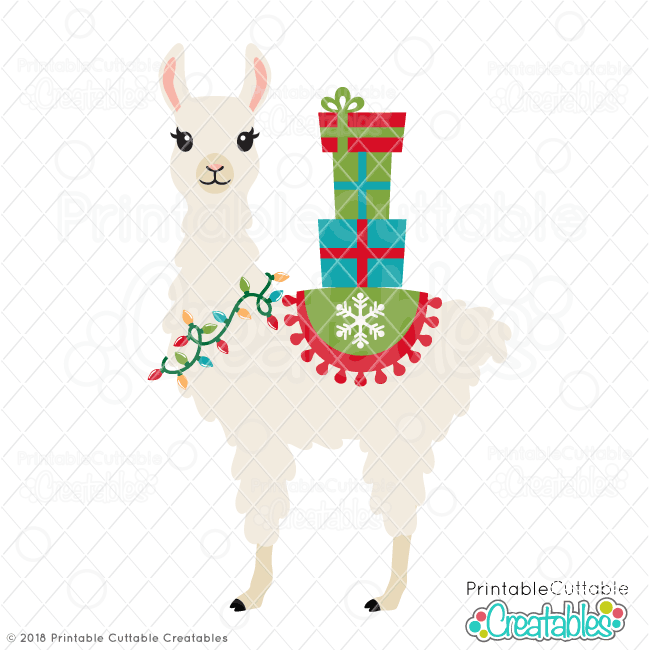 Also included are 3 high resolution 300dpi PNG Christmas Llama Clipart Files with transparent backgrounds, ideal for printable wall art, digital scrapbooking, and other printable projects! 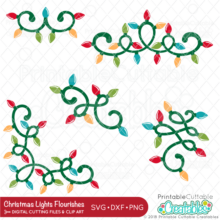 The Christmas Llama SVG File also makes great vector design elements for web and graphic design projects and are compatible with Adobe Illustrator, CorelDraw, Inkscape, and other vector programs that open SVG files. I LOVE to see my designs used in your creative projects! That’s why all “Creatables” (free or paid) include a Personal and Limited Commercial Use License in the base price! See my License & Copyright page for more info on permitted uses of my designs in your projects. We are proud to offer Hassle-Free Replacement & Full Support on all orders! While we highly recommend backing up your purchases, if your hard drive crashes, files get corrupted or you ever need to re-download your items for any reason after the initial download term has expired, just contact us with your Order # and we’ll be glad to re-activate your link so you can re-download your products without having to repurchase! We also provide Full Support for all orders, Free or Paid, so if you have ANY questions about our files or how to use them, don’t hesitate to contact us and we’ll be happy to help you through it! I would love to hear what you think! Leave a review for a design you’ve used, and it might be featured here! I have bought many cut files and clipart. THIS is by FAR the best, cutest, easy to cut files EVER! I will be back for more! Omg I’ve only just come across this website and oh my goodness so many beautiful designs. I’ve “purchased” some of the free files to see what they’re like and I’ve got to say that they’ve got to be the most beautifully and comprehensively laid out files that’s I’ve had the pleasure of working with. I will definitely not have any hesitation in paying money for future files (I may have a few in my basket already lol) thank you so much for such a beautiful and well thought out product. I’ve purchased almost a dozen SVG’s from this shop. They are user friendly and some of the best I’ve found. Highly recommend!! I absolutely love the SVG's. Your work is incredible. I highly recommend this site. I have bought a handful of files for papercrafting. They are so cute, very reasonably priced, and had easily understandable instructions on how to create. I love this site. 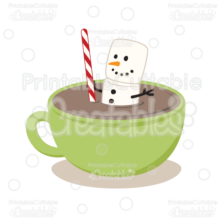 The designs are adorable and easy to use. Highly recommend!! [Kristin] went above and beyond answering my questions. The file cuts perfectly. Thank you so much!! Adorable, super easy to use file! Thank you so much! Love this shop and item~ wonderful and such an terrific shop owner.